LOT 1 - Lot of 4 bubble paper weights. LOT 2 - 19th. century English Ironstone baby dish. LOT 3 - Meerschaum pipe in case. LOT 4 - Vintage drafting kit. LOT 5 - Set of three English 19th. century soft paste china coffee cups. LOT 6 - Three Folk Art carved wooden bottle stoppers. LOT 7 - 3 Staffordshire figures; lady with sheep and farmers with cows. 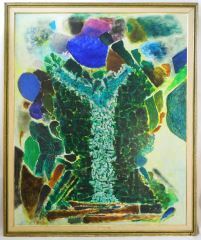 LOT 8 - Oil on canvas signed on label Ion Gheorghiu 1969, 51 1/2" x 41 1/2", "Vegatatie". LOT 9 - Oil on board signed P.(Paul) Hyltinen, 17 1/2" x 26 1/2", "Fall Mountain Landscape". LOT 10 - Watercolour signed R. Ellis, "Ship". LOT 11 - Picture signed T.V.D.Gracht, 12 1/2" X 17 1/2" "Trail Bay Sechelt". LOT 12 - Antique wicker corner chair. LOT 13 - Set of leather bound Old Testament books. LOT 14 - Asian rug, approximately 4'3" x 5'10". LOT 15 - Pair of oil on boards signed Little, 15 1/2" x 19 1/2", "Mountain Lake" & "Saskatchewan River". LOT 16 - Large pine wardrobe with drawers. LOT 17 - Folio 20 photgravures prints 1893. LOT 18 - Mahogany shaped top drop leaf side table. LOT 19 - Upholstered fireside bench. LOT 20 - Asian rug approximately 3'4" x 5'10". LOT 21 - Lithograph signed G.B.(Braque). LOT 22 - Watercolour signed on back Marjorie Ashworth, "Farm in Snow". LOT 23 - Art Deco walnut vanity with stool. LOT 24 - Oil on board signed R.Forrest, 15 1/2" x 19", "Going Fishing". LOT 25 - Watercolour signed M. Kluckner, '94. "Clayburn - Made in Canada". LOT 26 - Oil on canvas signed G.(George) Jenkins, 22" x 43", "Coastal Scene- Breaking Surf". LOT 27 - Pair of etching signed Lilian Murray "The Apple Orchard" and "The Swing". LOT 28 - Oil on canvas signed (Brenda) Morrison, 24" x 30", "Flowers and Fruit". LOT 29 - Cane back rocker. LOT 30 - Spode plate. LOT 31 - Pastel signed Wride,7 1/2" x 9 1/2", "Maligne Lake". LOT 32 - Five Arthur Checkley oil paintings, one signed, various sizes. LOT 33 - Watercolour signed E. Jaworski, "Farm scene". LOT 34 - Sampler of a religious quote. LOT 35 - Two paintings; one signed Arthur Checkley, 10" X 14" & 5 1/2" X 6 1/2 "Mountain Landscapes". LOT 36 - Small oak chest of five drawers. LOT 37 - Vintage top hat in box. LOT 38 - Five Arthur Checkley oil paintings, two signed, various sizes. LOT 39 - Pair of oil on boards, "Isle of White". LOT 40 - Copper fire fender. LOT 41 - Needlepoint foot stool. LOT 42 - Oak Rocker. LOT 43 - Asian rug approximately 3'6" x 9'10". LOT 44 - Ashton & Dolland thermometer barometer. LOT 45 - Brass Chinese punch bowl with cups and a ladle. LOT 46 - Antique style oak coffee table. LOT 47 - Lithograph, 27" X 33","Court Society at Versailles AD 1731". LOT 48 - Pair of Antique style mahogany tripod wine tables. LOT 49 - Upholstered sofa and matching chair with walnut show wood trim. LOT 50 - Watercolour unframed signed T. Owen- Flood Simon, "Coastal Scene". LOT 51 - Table top book case. LOT 52 - Walrus style scrimshaw. LOT 53 - 19th. century mahogany tilt top breakfast table. LOT 54 - Set of eight Victorian mahogany dining chairs, two needing repair. LOT 55 - Asian rug approximately 4'8" x 10'6". LOT 56 - Asian rug approximately 3'8" x 8'6". LOT 57 - Four paintings, two signed Arthur Checkley, 10" X 14" & 5 1/2" X 6 1/2 "Mountain Landscapes". LOT 58 - Needlepoint foot stool. LOT 59 - Pencil sketch signed Rose Elliott dated 1843. LOT 60 - A pair of Antique pine side chairs. LOT 61 - Pair of watercolours signed Joan Needham 13 1/2" x 11", "Family by the shore". LOT 62 - Adjustable mahogany piano stool with claw and ball feet. LOT 63 - Pair of sketches signed Winter (William A) '72 10 3/4" X 8 1/4". LOT 64 - Oil on board signed W.H.Sclater, 23" x 15", "Still Life-Flowers in Vase". LOT 65 - Watercolour unsigned, "Scarborough Yorkshire 1819". LOT 66 - Needlework upholstered side chair. LOT 67 - Oil on canvas signed KW '93, 16" x 20", "Chatham Island". LOT 68 - Walnut wardrobe. LOT 69 - 18th Century engraving by H. Bunbury, "Death of Imogen". LOT 70 - Oil on canvas signed Marilyn Casson 16" X 20", "Tumbling Waters". LOT 71 - Two watercolours "Forest and Mountains" and "Cabin in the woods". LOT 72 - Oil on canvas signed E. Grundstain 1951, 28 1/4" x 18 1/4", "Nurnberg". LOT 73 - Upholstered occasional chair. LOT 74 - Early 19th Century French coffee cup and 2 saucers. LOT 75 - Mason's Ironstone Tureen and Platter, "D", C. 1840. LOT 76 - Lot of 5 floral paper weights. LOT 77 - Watercolour signed Camponella, 14" x 20 1/2", "Mountain Landscape". LOT 78 - Oil on board signed B. Ollers 1949, 18" X 15" "Mountain Landscape". LOT 79 - Oil on canvas signed Galiard?, 20" x 24", "Forest Waterfall". LOT 80 - Watercolour signed Fred D Penney "Lake at Hermet California" 20 1/2" X 16 1/2"
LOT 81 - Victorian mahogany bow front chest of drawers. LOT 82 - Pastel signed M.(Margaret), Bonneau, 18 1/2" x 15 1/2","Morning Light". LOT 83 - Antique side chair with needlepoint seat. LOT 84 - Oak pressed back rocker. LOT 85 - Oriental carved chessman with two boxes. LOT 86 - Victorian mahogany drop leaf side table. LOT 87 - Hitchcock style rocker. LOT 88 - Asian carpet approximately 4' x 7'6". LOT 89 - Victorian carved mahogany armoire with mirrored door. LOT 90 - Antique rosewood framed mirror. LOT 91 - Antique carved oak display cabinet. LOT 92 - 3 piece Walker & Hall silver plated tea set. LOT 93 - Hand painted Nippon plate. LOT 94 - Carved mahogany armchair with upholstered seat and back. LOT 95 - Asian carpet approximately 8'4" x 10'6". LOT 96 - Lot of 4 floral paper weights. LOT 97 - Ivory and ebony dominoes set in carved box. LOT 98 - Unusual carved burl wood and metal pipe, 11". LOT 99 - 19th. century ceramic mug and a lattice work basket. LOT 100 - Hallmarked silver pocket vanity case, silver ring and a silver pencil. LOT 100A - Mexican 14K gold and sterling money clip. LOT 100B - Silver fruit paring knife. LOT 101 - Antique strawberry bowl and plate. LOT 102 - Antique carved oak chest. LOT 103 - Acrylic on board signed J. Slagboom, 9 1/2" x 13 1/2", "Esquimalt Lagoon". LOT 104 - Antique bureau with side cabinets. LOT 105 - Antiques tub style chair. LOT 106 - Watercolour signed R. Colpman, 13" X 9 3/4", "Mountain Lake". LOT 107 - Part tea set of Royal Crown Derby, "Mikado". LOT 108 - Victorian mahogany dining table with leaf and six carved mahogany side chairs. LOT 109 - Asian rug approximately 4' x 6'6". LOT 110 - Victorian mahogany upholstered armchair. LOT 111 - Two brass candle holders. LOT 112 - Limoges china part luncheon service. LOT 113 - Victorian mahogany dining table with leaves. LOT 114 - Pair of Victorian upholstered side chairs. LOT 115 - Asian carpet approximately 8'6" x 12'. LOT 116 - Edwardian walnut button back chaise. LOT 117 - Gerhard Heintzman gramophone with records. LOT 118 - Chinese brass bulb bowl and covered censor. LOT 119 - Lot of 3 large apple paper weights. LOT 120 - Victorian oak hall table fitted with a glass top. LOT 121 - 19th Century Anamere bottle vase. LOT 122 - Royal Doulton "Fishing" vase. LOT 123 - Pair of opera glasses and a darner. LOT 124 - Lot of 5 floral paper weights. LOT 125 - Royal Crown Derby tazza. LOT 126 - Set of six Worcester 19th. century floral painted plates. LOT 127 - 4 English Arts & Crafts tiles. LOT 128 - Pair of Art Nouveau vases. LOT 129 - Antique oak breakfront bookcase with art Nouveau handles. LOT 130 - Victorian mahogany tub style armchair. LOT 131 - Lot of 4 abstract paper weights. LOT 132 - Elkington silver plated cream and sugar. LOT 133 - Antique pewter tobacco box. LOT 134 - Antique Dresden Candelabra 19th Century European figure and a figurine. LOT 135 - Watercolour signed John Herreilers, 12" x 16", "Ducks in marsh". LOT 136 - Asian carpet approximately 8'6" x 11'9". LOT 137 - 19th C. print, "Glyptothek Och Pina Kotheki Munchen". LOT 138 - Victorian mahogany bow front chest of drawers. LOT 139 - Victorian mahogany barley twist side chair. LOT 140 - Victorian mahogany parlour table. LOT 141 - Set of 4 inlaid mahogany Art Nouveau parlour chairs. LOT 142 - Antique inlaid mahogany wardrobe. LOT 143 - Oil on canvas signed Rob Bryn, 19" X 27" "Harbour Scene". LOT 144 - Acrylic signed Kirby, 14 1/2" X 26", "Inukshuk". LOT 145 - Bronze based Fairy Lamp with beaded shade, overall 11 1/2". LOT 146 - Watercolour signed Lionel Stretton, 5 1/2" X 10 1/4" "French Bi-Plane"
LOT 147 - Victorian oak double pedestal leather inset desk. LOT 148 - Mahogany commode bench. LOT 149 - Oak cased banjo barometer thermometer. LOT 150 - Oak fall front bureau. LOT 151 - Barley twist armchair with blue upholstery and lion decoration. LOT 152 - Blue porcelain compote decorated with gold stars. LOT 153 - Pair of Victorian brass candlesticks. LOT 154 - Victorian mahogany tripod tilt-top table. LOT 155 - Asian rug approximately 4' x 6'. LOT 156 - Two 19th. century silk cambric and wool bodices with purse and jet reticule. LOT 157 - Copper coal hod. LOT 158 - Antique carved oak chest. LOT 159 - Asian rug approximately 3'3" x 4'6". LOT 160 - Victorian lady's and gentleman's chairs. LOT 161 - Oil on canvas signed L.Viorsky, 20 1/8" x 26 1/8","Travelling by horse and wagon". LOT 162 - 5 Pieces of 19th Century Spode china, "Abbey"; two platters, 2 veg. dishes & teapot. LOT 163 - Antique mirror back oak sideboard. LOT 164 - Pastel signed J. Plaskett 1955, 16" x 10","View of Sarajevo". LOT 165 - Pair of copper lustre vases and a copper lustre pitcher. LOT 166 - Three Chinese Export butterfly decorated plates. LOT 167 - Continental china figurine of a seated lady with basket. LOT 168 - Watercolour of a building. LOT 169 - Oil on canvas unsigned, 11" X 14", "Fall Landscape". LOT 170 - Oil painting on canvas signed Wessling, 15 3/4" x 19 1/2", "July Landscape". LOT 171 - Watercolour signed Caren Heine, 17 1/2" x 12", "Peony". LOT 172 - Chinese Imari plate with stand. LOT 173 - Pair of Islamic illuminations on ivory, 6" X 5 3/4", 5 3/4" X 3 1/2". "Court Scene" & "Dancers". LOT 174 - Antique marble top walnut sideboard with arched back. LOT 175 - Pastel signed Arthur Checkley, 12" X 18", "Coastal Landscape". LOT 176 - Oil on canvas signed W. Hendriks, 12" x 16", "Winter by the Stream". LOT 177 - Oil on canvas, "Coastal Landscape". LOT 178 - Late 19th century swiss wall barometer. LOT 179 - W/C with ink signed with monogram- (Margaret Maclure), 5" x 3 3/4", "Native Woman w.Red Scarf"
LOT 180 - Watercolour signed with monogram- (Margaret Maclure), 5 1/4"x 3 1/2", "Woman w.Yellow Scarf". LOT 181 - Watercolour with ink signed with monogram(Margaret Maclure),5 1/2" x 3 1/2","Woman in Blanket". LOT 182 - Pair of 19th century brass candlesticks. LOT 183 - Early 19th Century French chocolate pot. LOT 184 - Deeply cut Victorian crystal shallow dish, 13". LOT 185 - Victorian boulle rosewood tea caddy, 13". LOT 186 - Early Victorian mahogany dining table. LOT 187 - Pair of Victorian carved mahogany side chairs. LOT 188 - Asian rug approximately 4'10" x 7'. LOT 189 - Wedgwood milk jug. LOT 190 - Mahogany nest of three tables. LOT 191 - Inlaid mahogany circular jardiniere stand. LOT 192 - Antique grape pickers basket marked "Chateau du Pape".